Blackline’s Loner Mobile lone worker app turns an iPhone®, Android™ or Blackberry® into a simple and non-intrusive safety monitoring platform. 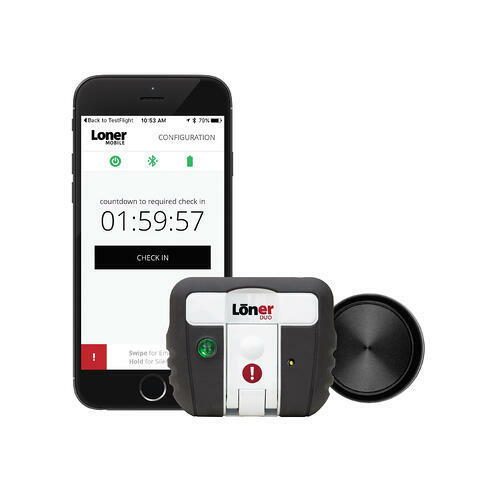 Loner Mobile leverages Blackline’s Loner Duo and SOS Button accessories, which feature Bluetooth® Smart communications and pairs with a smartphone’s Loner Mobile app. To request help manually, all safety monitoring apps — including Loner Mobile — require the user to access their smartphone, unlock it, access the safety app and trigger an emergency request. This takes time the employee may not have. Loner Duo or the SOS Button provide a critical physical interface to instantly call for help, with both automatic and manual triggers. All safety incidents are communicated to live monitoring personnel through Loner Mobile — Duo and the SOS Button automatically communicates falls (Loner Duo additionally communicates no-motion events) with Loner Mobile, which then initiates contact with monitoring personnel. Alternatively, the manual SOS latch (Loner Duo) can be pulled or the button (SOS Button) can be pressed to initiate a response. Loner Duo and the SOS Button ensure a worker’s safety is being monitored, even if their smartphone is out of reach, and that responses are directed to the employee’s precise location. Both Loner Mobile and Loner Duo functionalities are tailored in Blackline Live safety monitoring portal, wirelessly and over-the-air. Use of Loner Duo and SOS Button amplify the base capability of Loner Mobile that already includes two-way voice communications to monitoring personnel, BS 8484 lone worker code of practice for the United Kingdom and communicating notes to monitoring personnel that provide valuable context to work being performed by the lone worker.